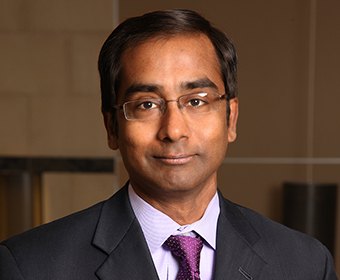 As Interim Vice President for Research, Economic Development, and Knowledge Enterprise, Arulanandam is leading the growth and advancement of UTSA as a research intensive university. (Dec. 12, 2018) -- Bernard Arulanandam, Jane and Roland Blumberg Professor in bioscience at UTSA and the university’s interim vice president for research, economic development, and knowledge enterprise, has been named a Fellow of the National Academy of Inventors (NAI). The honor recognizes Arulanandam for demonstrating a prolific spirit of innovation in creating and facilitating outstanding inventions that have made a tangible impact on quality of life, economic development and the welfare of society. View the complete list of NAI Fellows.